This article goes over Wind Power its major benefits in an off-grid home, notable Advantages Offered By the Wind Power to Common Households and Off-Grid Systems, and using it in an Alternate Energy plan while remaining Compatible of solar hydro and wind power. The wind is a natural energy that fills up the entire atmosphere of the earth and helps the living organisms survive on this planet. 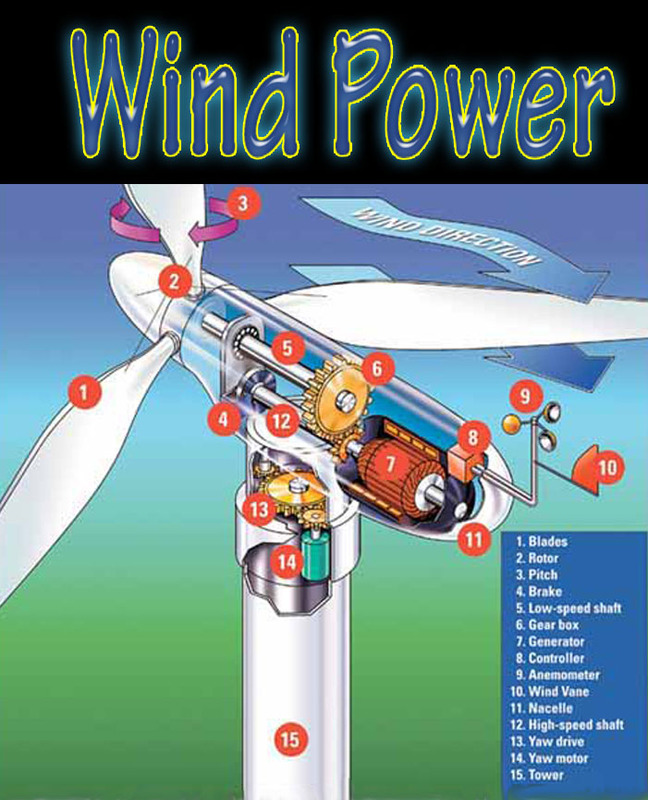 The wind turbine is the unique device that is used for using the flow of wind to turn this mechanical energy into electricity. As wind is freely available on earth’s surface, it can provide free electricity to run all kinds of electrical appliances that are used for domestic, agricultural or commercial purposes. Hence, the use of wind power has gained huge popularity among the common mass, as the most beneficial alternative source of energy. The onshore and offshore winds are the best sources of wind energy that can be consistently used as a cheap source of electricity, which can be produced by the wind turbines. The blades form the main aerial part of the wind turbine, as the wide surfaces of these blades form a solid obstacle in the way of the wind force. Thus, the wind energy is transmitted to these blades, by which the blades are moved around the rotor of the turbine. The shaft is another main part of the wind turbine, which is rotated by the rotational energy that is formed from the transformed wind energy through the rotor. This shaft is quite sturdy to handle the wind force, while the transformation of mechanical to rotational energy. The generator is the third vital component of the wind turbine, which turns the electrical charge produced from this rotational force into voltage power that is used to draw the electricity through the electrical lines to the designated appliances. However, there are more complicated wind turbines with more components, which are used for the production of large-scale wind power. The wind power is one of the cheapest sources of energy, as wind force is available for free worldwide. Moreover, the simple wind turbine is available at an affordable price that can be bought by any common person. There is also no tension of the exhaustion of this energy form, as wind flow can never stop on the earth. The wind energy is as eco-friendly in nature as the solar power, as no harm is caused to the surrounding environment during its production. Unlike the production of thermal power, the wind energy production does not contribute to the global warming. As the wind power can be produced at any time, the owners of wind turbines do not need to depend on the conventional electric supply anymore, thus saving a huge amount of money on the monthly utility bills. The wind turbines require very small space for installation and thus, the owners of small lands do not need to worry about the lack of sufficient place for availing this alternative energy. The wind turbines of the latest designs are quite attractive in appearance and available in many sizes, enabling the buyers to choose according to their requirements. Though the wind is available all the time, its force may not always be the same everywhere. The wind power production increases during the winters, when the air becomes denser and heavier that can move the turbines more easily. The situation may not be favorable for energy production all the time, when the storage of electricity in a battery proves to be very useful. Hence, off grid wind energy is also useful during the poor weather conditions, when even solar power may not be available due to cloudy sky. The wind power is perfectly compatible with the uses of solar energy and hydro power, as all are inexhaustible sources of natural energy. The solar power is generated in an independent system that does not interfere with the use of other alternative sources of energy; like wind power or hydro power. Thus, the house owners can also use these sources of power alongside the use of solar energy.